Versa Lift is a powerful electric lift that takes your home organization and storage to the next level. 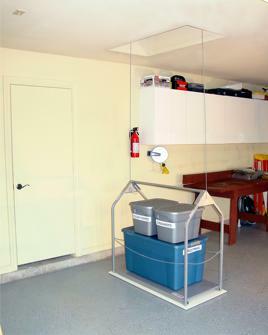 Now you can send garage clutter to your attic and out of sight with push-button ease! 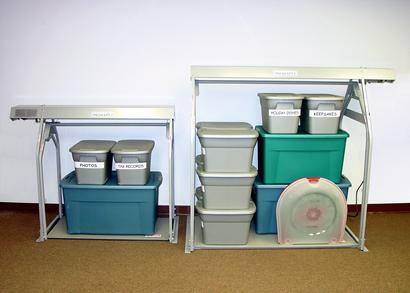 Occasional use items like ice chests and luggage don't have to take up valuable floor space. You can send them away when not in use and get them back in seconds when you need them! We will ship anywhere in the United States. We will beat any price on the web. has a 15.3 cubic foot, 200 lb. lifting capacity. The lifting platform is 20.75" x 44". For Model 24 Specifications, Rough-In Guide, Installation Guide & Owners Manual see below. has a 35 cubic foot 250 lb. lifting capacity. The lifting platform is 28.75" x 56". For Model 32 Specifications, Rough-In Guide, Installation Guide & Owners Manual see below.